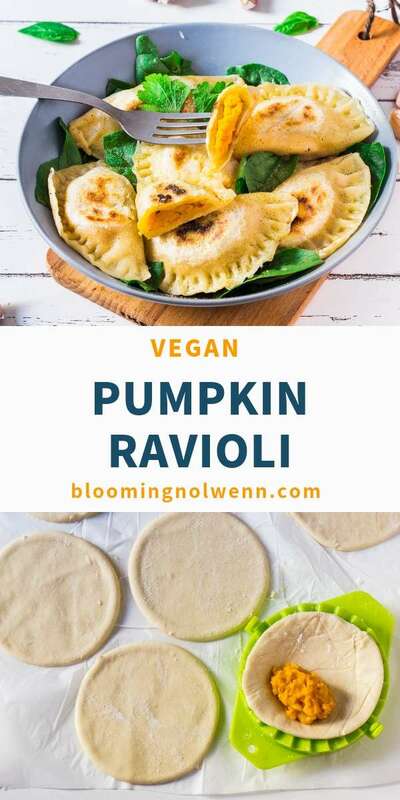 These Homemade Vegan Ravioli are easy to make and delicious. They are filled with a creamy pumpkin filling that is perfect for fall and Halloween season! Would you believe me if I said that making your own ravioli is really easy? The pasta dough can be made in under 5 minutes and only requires 3 ingredients: flour, water and a little bit of olive oil. Then, all you have to do is roll it out thinly, cut out circles, fill the circles with your favourite filling, seal them with a fork and boil them for 3 minutes. 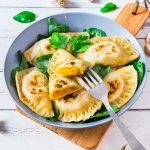 If you’re used to buying ravioli at the store, I hope this recipe is going to make you want to make your own. I know making pasta can be intimidating but it really is easy and SO worth it! 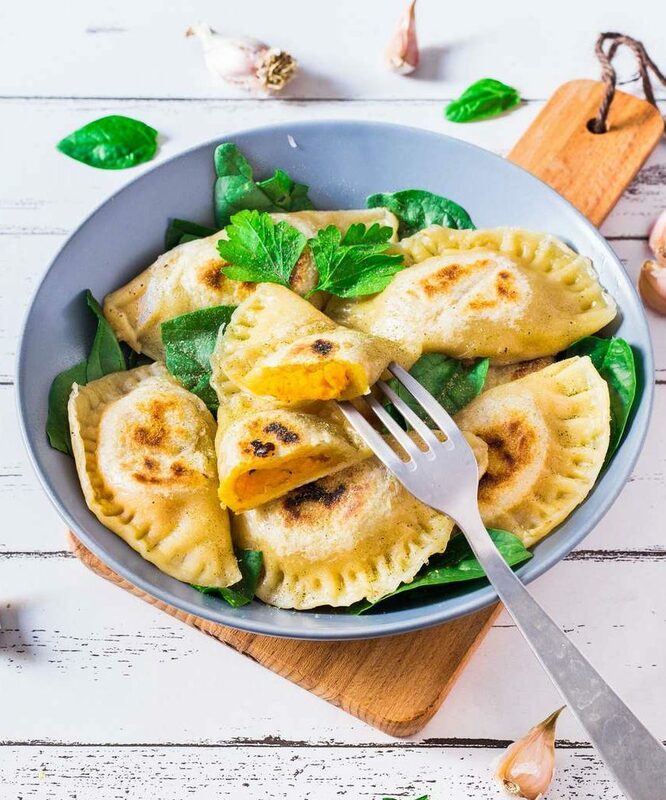 Homemade ravioli are a lot healthier than store-bought ones, too. 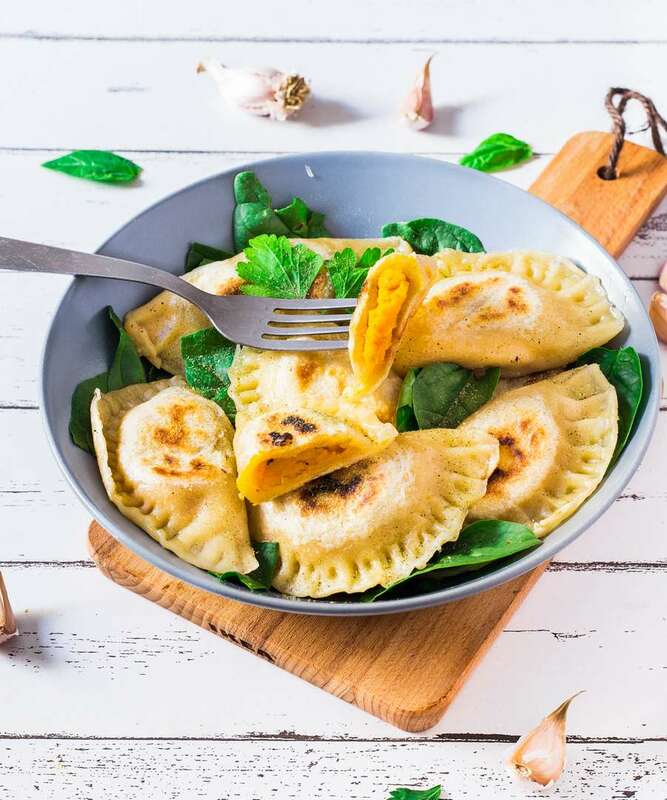 The best thing about making your own ravioli, is that you can be very creative and use any filling you like. 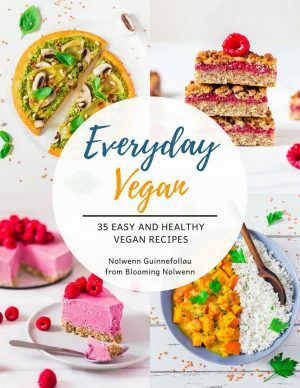 I filled mine with a creamy pumpkin filling but you could also use vegan bolognese, basil pesto, cashew ricotta and more. 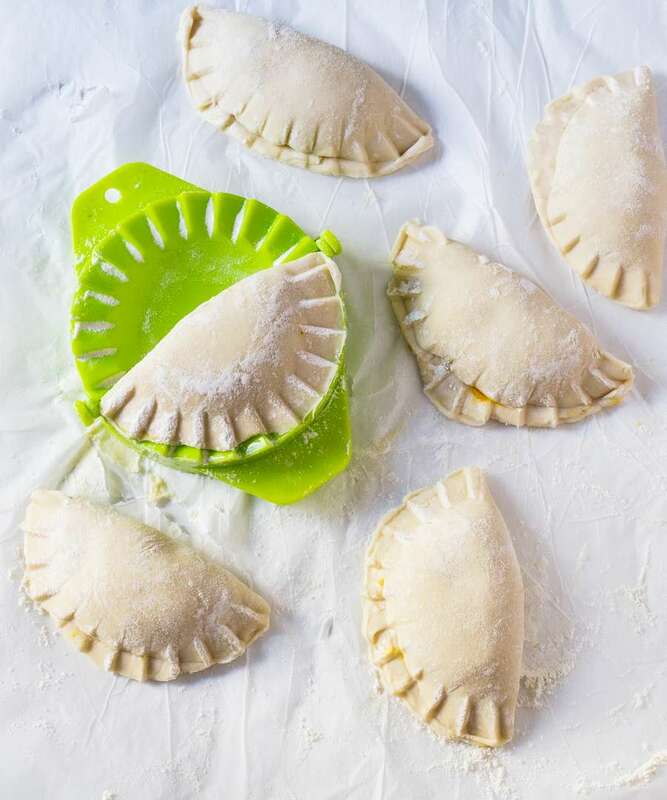 Once you have filled each circle with your favorite filling, lightly brush the sides with a little bit of water and fold them in half over the filling. If you don’t have a ravioli maker, no worries! Simply use a fork to seal the edges and prevent the ravioli from opening. Then, place the ravioli in boiling water and cook until they float to the surface (2-3 minutes). You can enjoy them like this with tomato sauce or you can sauté them in a little bit of coconut oil for a couple of minutes until they become slightly crispy. To a bowl, add flour, water and olive oil. Combine everything together with a fork until you obtain a dough. Knead the dough for 2 minutes, then cover it with a clean kitchen towel and place it in the fridge for 1 hour. Steam or bake pumpkin for 25 minutes or until fork-tender and mash it with a fork. Simply skip this step if you are using canned pumpkin puree. Add all pumpkin filling ingredients to your blender and blend until smooth and creamy. Taste and adjust seasonings if necessary. Take the prepared dough out of the fridge and roll it out thinly between two pieces of parchment paper or on a lightly floured surface. 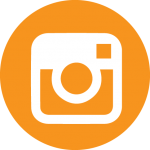 Using a glass or a ravioli cutter, cut out medium-sized circles. 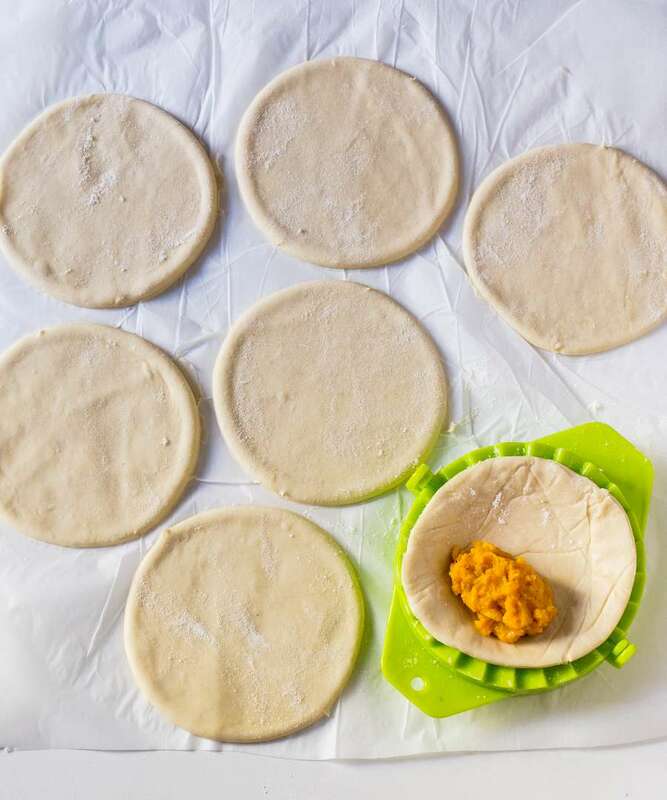 Roll out leftover dough and repeat this step. Place approximately 1-2 tsp of pumpkin filling in the center of each circle. Lightly brush the sides with water and fold each circle in half. Seal the edges with a fork to prevent the ravioli from opening when you cook them. 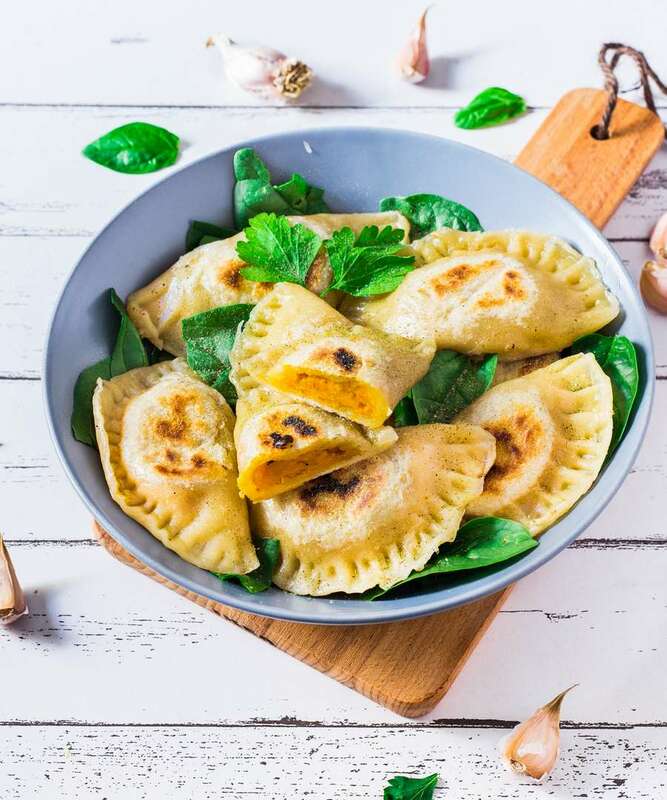 To cook the ravioli, bring a large pot of water to a boil and carefully add in the ravioli. Simmer until they float to the top (2-3 minutes), it means they are cooked. Remove from the pot and drain. 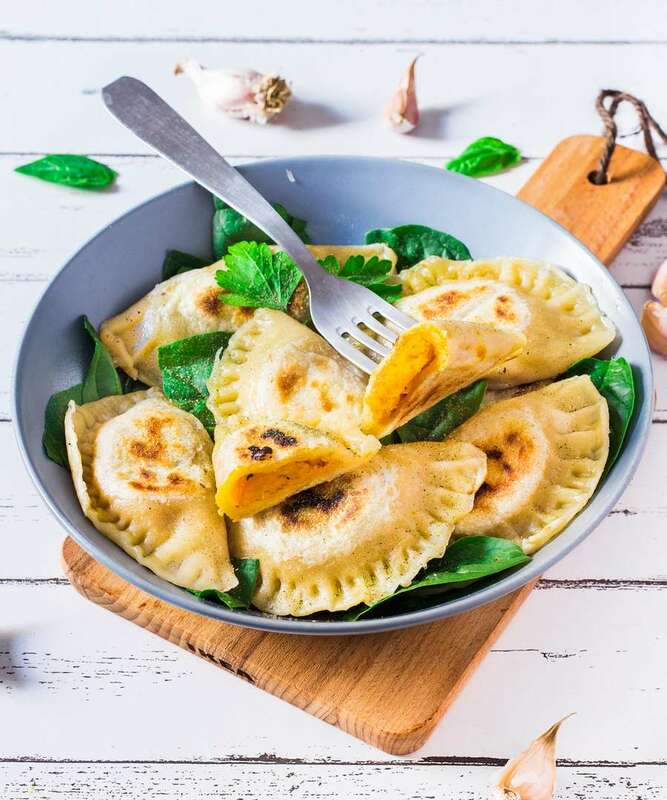 Once ravioli are cooked, you can sauté them in a little bit of coconut oil until they are slightly crispy. Use any filling you like! I love using vegan bolognese sauce and basilic pesto. I haven’t tried this recipe with gluten-free flour so I can’t tell you for sure if it would work or not. 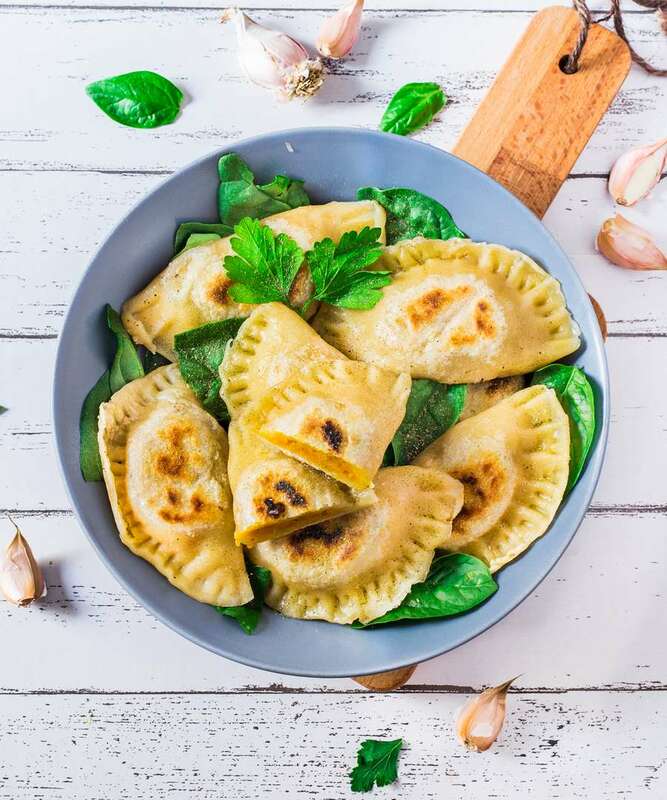 Without gluten, the pasta dough might turn out a bit dry and you might have trouble making the ravioli.